This is the public profile of Shantanu Jog, Additional information and high-resolution images are available for accredited press members, to access additional information about Shantanu Jog please login as a press member. About Shantanu Jog : Shantanu Jog is an automotive designer, with a special interest in motorcycles. He currently works with Ather Energy, an upcoming electric vehicle manufacturer based in Bangalore, India, and has been there since 2014. His previous stint was with TVS Motor Company at Hosur, India, for about five years. He believes that efficient vehicles should also be fun to ride/drive, and that electric energy is the way ahead for transportation. He is of the strong opinion that long -lasting design is that which has an impact through its functionality, proportions and attention to detail. He believes that there is no substitute to in-depth research, sketches and physical models. Design is that which achieves the intended usage in a functionally superior way and it helps a lot if the aesthetics reflect the same. Design is focused towards one or more goals, or requirement/s. Art is that which represents the creator's thoughts in their own personal way, but it may or may not be interpreted in the same way by the viewer. 2008, Industrial Designer, M.Des, Industrial Design Centre, IIT Bombay, MUMBAI/INDIA. October 2008 - June 2014, Designer, TVS Motor Company Ltd., HOSUR/INDIA. July 2014 - Present, Designer, Ather Energy, BANGALORE/INDIA. 2016, "Ather S340", Autocar Professional, Pages 21-23, January 30, INDIA. 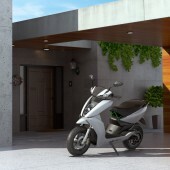 2014-Present, Ather Energy, Designed the S340. 2008-2014, TVS Motor Company, Worked on various projects. Press Members: Request an exclusive interview with Shantanu Jog.